With its bright, fearless decal package and array of factory options, the Jeep J10 Honcho makes a bold statement on or off the road. Without the correct stripes this truck is just another J10, and your full size Jeep deserves the best restoration decals available. Our 1981-1983 short bed Townside Honcho stripe kit is manufactured to meet or exceed OEM specifications and includes everything you need for a factory fresh appearance. If you have a Stepside Sportside click here. This kit contains 12 very large 4-color decals and stripes. It is the first time this kit is offered since being discontinued decades ago. 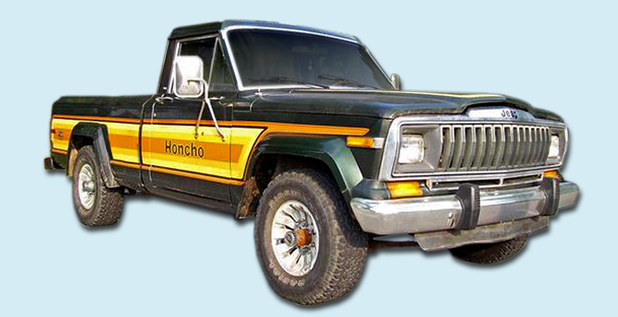 If you do not know whether your Jeep is a "Honcho," click here.